Daily Illuminator: Two Times The Trouble! March 11, 2013: Two Times The Trouble! When you're looking for arena antics in Car Wars, you can never have too many options. 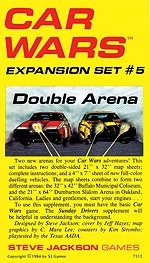 We at e23 are happy to provide more, this time in the form of Car Wars Expansion Set 5 - Double Arena. This classic is back in digital form, providing details on two locales suitable for tire-squealing stunts. The first spot is the Dumbarton Slalom Arena, a long and skinny arena that rewards precision driving. The second is the Buffalo Municipal Coliseum, a gargantuan arena where the contract went to the smallest bidder. Once again, this digital edition include versions of the maps that can be printed and assembled using standard-sized paper (in addition to the oversized versions for those with access to huge printers). Get twice the automotive anarchy with Car Wars Expansion Set 5 - Double Arena!